Last week when I sat down to scan a few of the D-Backs cards we got signed this past Spring Training, this is the first card I grabbed. 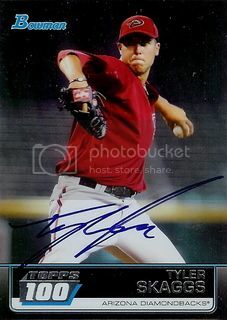 I remembered getting Patrick Corbin's autograph but couldn't remember what type of card I had for him to sign. It turns out that we had his 2011 Topps Pro Debut card. 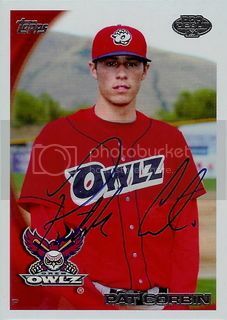 It features him on the Orem Owlz, the Angels Rookie ball team. My memory of this guy must be all around awful because I had also forgotten that we got him as part of the Dan Haren deal. 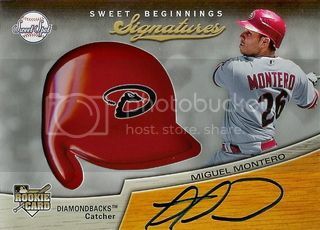 I'm sure he'll have some Diamondbacks cards next year but for now this one's a nice part of our D-Backs collection. After hitting below the Mendoza line in 100+ at bats this season, Daric Barton has found himself back in Triple A again. I'm disappointed for him. When the A's got him from the Cardinals way back in 2004 as part of the Mark Mulder deal, he seemed like a can't miss prospect. Unfortunately he missed. That means there's not much of a market for his 2008 Topps Chrome certified autos. I paid less than $3 shipped for this blue refractor numbered to 200. The fourth is from July 8, 2008. It features former Tigers infielder, Carlos Guillen. In case you were wondering, the Tigers beat the Indians that day 9-2. Miguel Cabrera hit two home runs and Justin Verlander struck out 7. 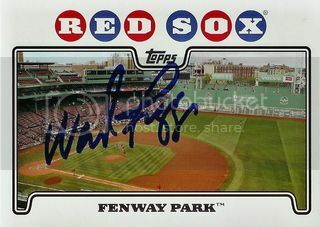 For those of you keeping track at home this is our 495th signed 2008 Topps card. We've officially hit the 50% mark for the 990 card set! Frank Catalanotto signed this card for us via his charity. Frank was one of those no nonsense guys who always worked hard. 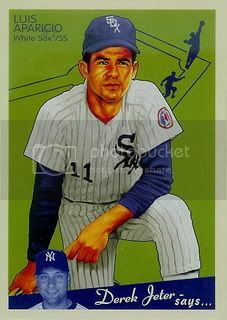 During his career he played every position except shortstop, center field, and pitcher. Hey, Frank! Thanks for helping us make history. Today seems like a good day for a Lil Luis post. I've had this card scanned for awhile. So long that I don't even remember where I got it. It's from the 2008 Donruss Threads set. I believe it's a gold century proof parallel since it's numbered 25/50 on the back. Kind of a bland card but the shinyness that comes along with the parallel makes it cooler. I grabbed this one for our D-Backs collection. I didn't know much about Yazy Arbelo when I bought it but AZSnakePit.com did a short write up on him last week. Despite some impressive power numbers, I guess he's not exactly a top tier prospect. That's okay. This card is a nice card and it was cheap. I'm still happy. Two weeks ago, I wasn't sure if I wanted to bother with the parallel versions of Daniel Hudson's 2012 Bowman Platinum autographed card. Well I ended up finding the blue version ( 75/199 ) for about $5 shipped. I couldn't say no. 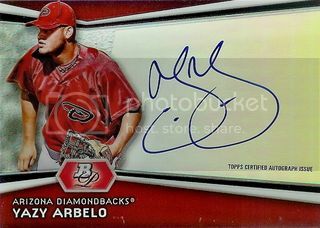 Over the weekend I scanned a few of the D-Backs cards that we got signed during Spring Training. I realized quite a few of the prospects that we got autographs from back in February have been called up to the big club. Another prospect will be making his debut today. I'll be there to watch Tyler Skaggs as he takes the mound at Chase Field for the first time in the first game of a day/night double header. We don't have many day games in Arizona and I had been thinking about taking my son to one for awhile now. It's our good fortune that Skaggs will be pitching at the game we have tickets for. Hopefully we can win both games today against the Marlins and split the series. The third is from September 8, 2008. It features former Tigers outfielder, Curtis Granderson. In case you were wondering, the Tigers beat the A's that day in a 14-8 slugfest. Magglio Ordonez, Gary Sheffield, and Miguel Cabrera all hit home runs. I'm working on the first rainbow for our Daniel Hudson collection. I think we have all of the different versions of his 2012 Bowman card except the printing plates. We have the base, the international, the silver ice, the gold, the orange ( 103/250 ), the blue ( 452/500 ) and the red ice ( /25 ). Man, I haven't made a custom card in over a year. I've been meaning to see what I could come up with for a custom SLU card all summer. I finally sat down and got to work. 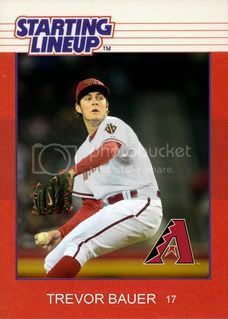 After a few minutes of tinkering, I came up with this one of Diamondbacks prospect, Trevor Bauer. Growing up my dad and I enjoyed collecting Kenner Starting Lineup figures. I still have a ton of figures and cards. I guess we bought them hoping they'd be worth something one day. Unfortunately they now have more sentimental value than actual value. 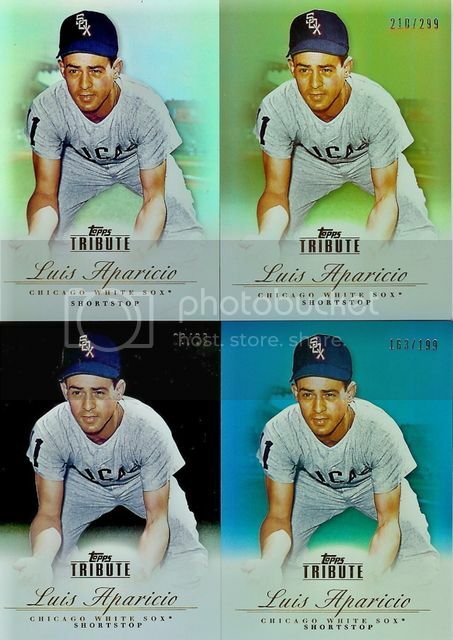 I've slowly been building a rainbow of Luis Aparicio's 2012 Topps Tribute cards. I now have the base version, the bronze ( 210/299 ), the blue ( 163/199), and the black ( 03/60 ). There's still a green ( /75 ) and a gold ( /25 ) version out there. I may or may not try to grab those. For now I'm happy withese these four. Brian from 30-Year Old Cardboard helped us out with a few more Diamondbacks cards. 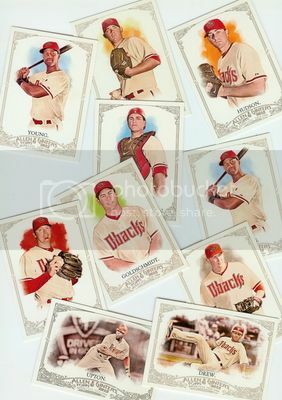 I'm pretty sure this is the entire team set from the 2012 Allen & Ginter set. All of my favorites like Daniel Hudson, Ian Kennedy, and Paul Goldschmidt are here. Having all of these cards is great news for me. I like A&G but I never seem to get anything good in packs. I only bought three this year and didn't get anything good. Not even one D-Backs player. 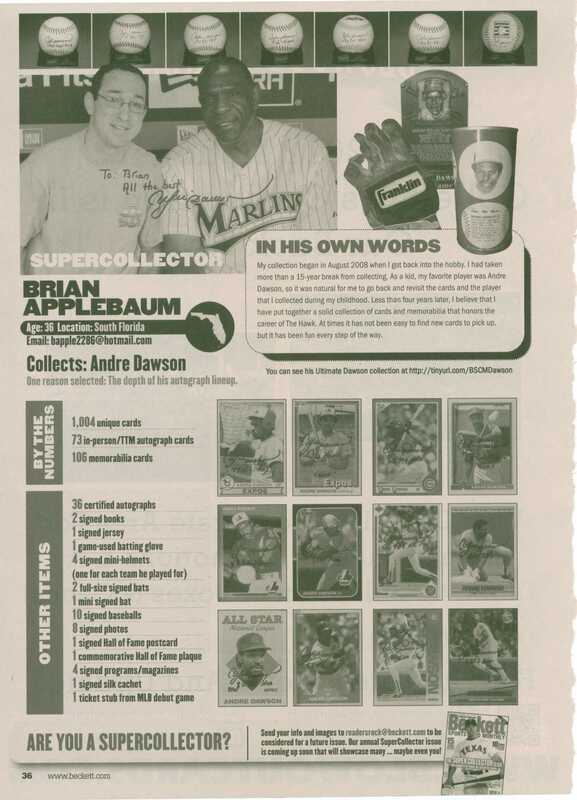 If you haven't been to his blog recently, he just celebrated his four year anniversary, his 7000th post, and his Andre Dawson collection was featured in Beckett Magazine. Very impressive. If there was a Hall of Fame for sports card bloggers, 30-YOC would have my vote. Thanks for giving us something cool to read every day, Brian. I know I appreciate knowing I can always stop by your blog and find something new. 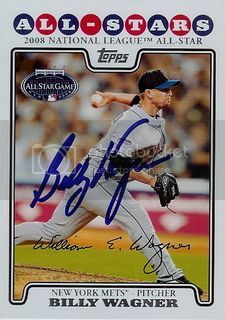 During that Billy Wagner private signing we were also able to get his All-Star card from the 2008 Topps Updates & Highlights set signed. I was surprised to learn that Billy was a seven-time all-star during his career. His 422 saves puts him currently at fifth on the list of all-time saves leaders. During the next few years there will be a lot of talk about closers and where they fit in the Hall of Fame. I think there's a good chance Billy gets in. Here's another great addition to our 2008 Topps set. 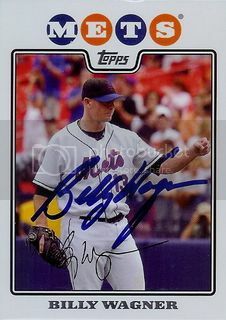 Earlier this year a friend on SportsGraphing.com was holding a private signing with Billy Wagner to benefit Billy's charity. I responded right away and a few weeks later I got this great looking card back signed for our set. The second is from September 4, 2008. It features former Tigers outfielder, Curtis Granderson. 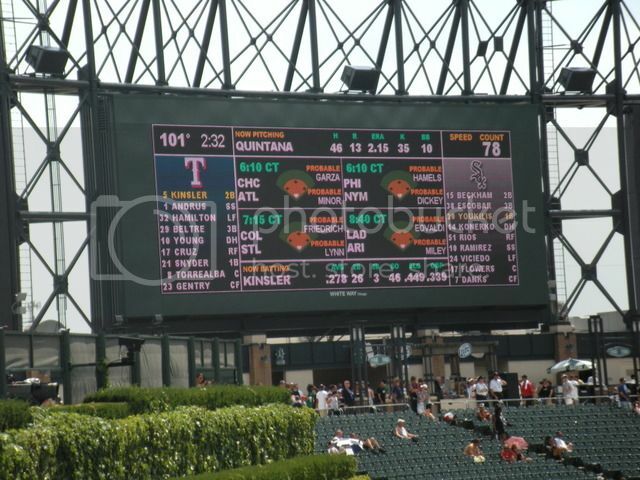 In case you were wondering, the Angels beat the Tigers that day 7-1. The Tigers lone run came from a Curtis Granderson home run. Many of the schools in my area are back in session today. I remember ever popular "How I Spent My Summer Vacation" assignment teachers would give out on the first day. I thought today would be a good day to talk about my family's recent trip to Chicago. The first week of July, we set off for the Windy City. My wife and son had never been there so we had a few ideas of things we wanted to do. However, the only two solid items on our itinerary was a Sox game and a Cubs game. We went to see the White Sox on July 5th. 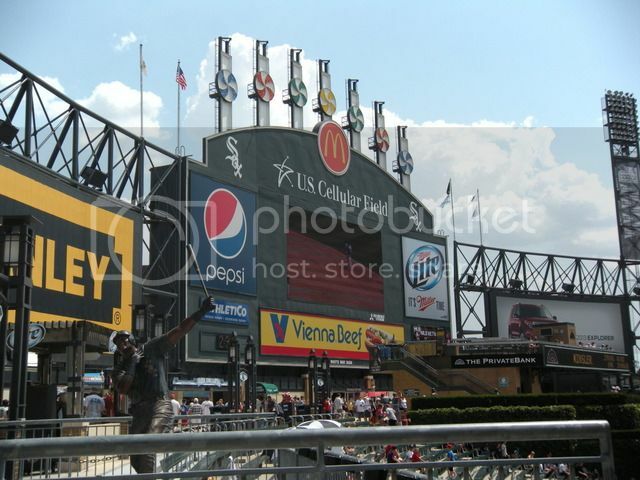 It was to be my first time at U.S. Cellular Field so I was excited. The Midwest has been having an extremely warm summer and this day was no exception. The temperature that day was over 100 degrees and it was pretty miserable outside. We toughed it out and made it through the entire game. 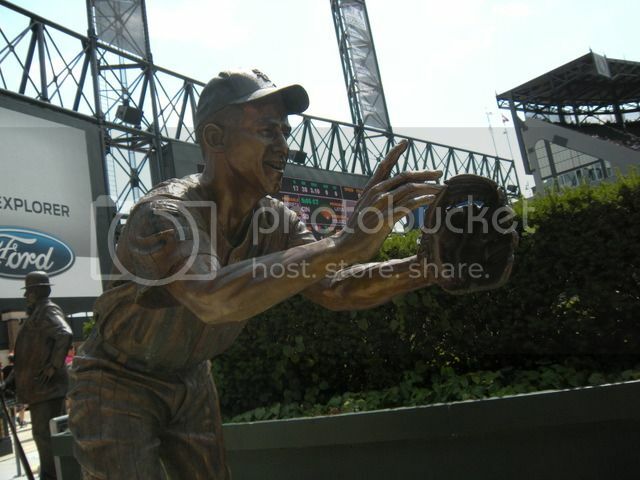 Of course we spent a great deal of time in the outfield over by the Luis Aparicio statue taking tons of pictures. The White Sox beat the Rangers and everyone had a pretty good time. 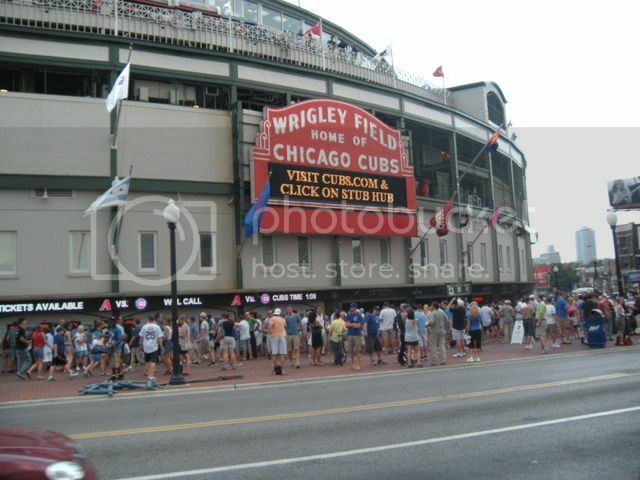 On July 13th, we made our way to Wrigley Field decked out in D-Backs gear to see the Cubs play the Diamondbacks. Awesome, right? It should have been except for right at game time, it started to rain. 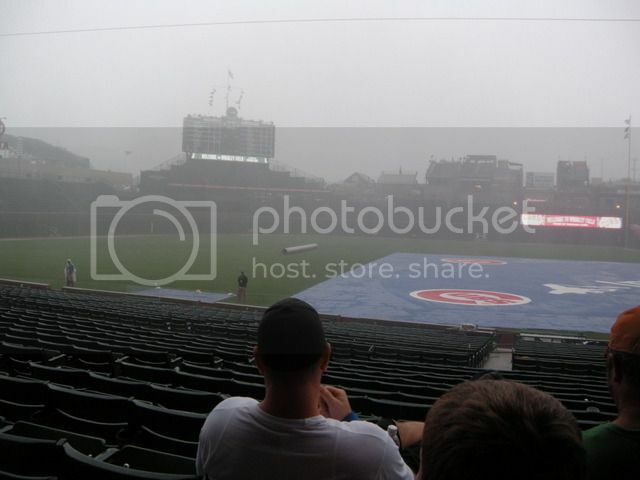 Our seats were in the lower section but just far enough back so that the upper deck blocked most of the rain. That was great until the wind started up and everyone who stayed in their seats got soaked. 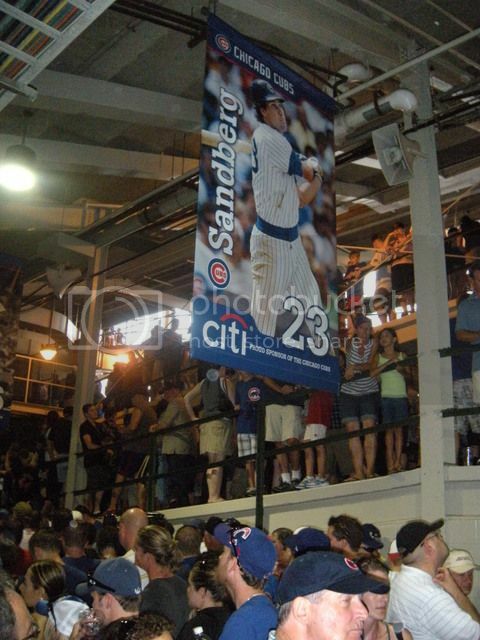 We all sought cover on the concourse. With 40,000 wet people huddled in the small area, I felt like we were on the Titanic. Four hours later when the game finally started, the Cubs beat the Diamondbacks. The weather definitely wasn't on our side either of those days. It gave me a greater appreciation for Chase Field's air conditioning and retractable roof. I'm happy that my son gets to cross two more stadiums off his list of one's that he's been to. He's four years old and his grand total is up to four. Not a bad start for a little dude. That's how I spent my summer vacation. Last week the Diamondbacks held a scavenger hunt in eight locations across Arizona. Each day they gave different clues on Twitter as to where fans could find golden Gerardo Parra bobbleheads. Only the first eight people at each location would win. The Tuesday location was on my side of town so I figured I'd give it a shot. My wife said I was probably wasting my time. I responded "Don't worry, I've got this." After clue number two I headed over to our old neighborhood Taco Bell and was the fifth D-Backs fan to arrive. 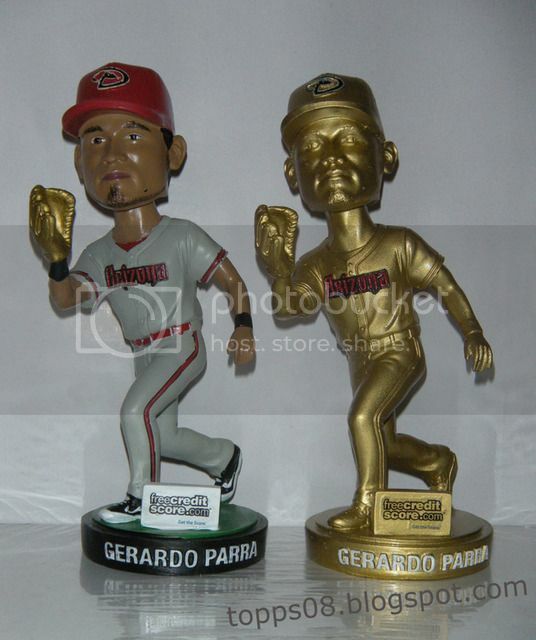 In addition to the golden bobblehead I won two, lower level tickets to Saturdays game where they were giving away the non-golden Gerardo Parra bobbleheads. The whole thing was really cool plus I ran into Dan from It's Like Having My Own Card Shop. 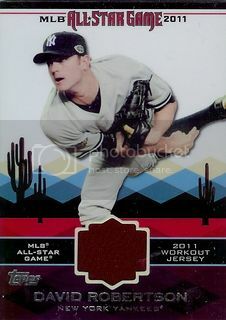 Justin from Justin's World hooked us up with a sweet David Robertson jersey card for our 2011 Topps All-Star Jersey collection. Thanks, Justin! I'm not sure exactly how many of these we have. I guess I need to build a checklist. I'll get to work on that. The stack of D-Backs that Dennis from Too Many Verlanders sent us a few weeks ago inspired me to send off a few TTM autograph requests. The first one we've received back is from former Diamondbacks manager, Al Pedrique. Al was our manager for the second half of the season back in 2004. I didn't even know he had a D-Backs card. 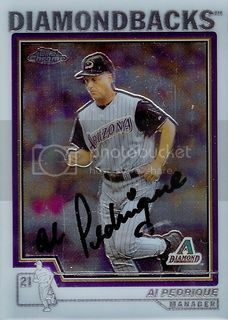 He signed this card from the 2004 Topps Traded Chrome set for our Diamondbacks collection. Thanks, Al! Believe it or not, I've won this card on eBay three separate times and this is the first chance I'm getting to post it. The first one, the seller never shipped the card to me. I got a refund so that's okay. The second card I won, my wife claimed for her own. I was opening the mail in the car and she liked it. Miguel Montero is her favorite D-Back so I let her keep it. She stashed it away somewhere so I never got a chance to scan it. 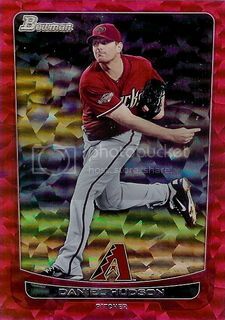 I won the card below last week and I finally was able to scan it, put it away with my other D-Backs cards, and write this post for this really cool card. 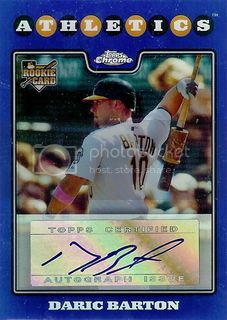 This is the only card I've seen from the 2007 Upper Deck Sweet Spot set and I love it. The little fake, plastic helmet is pretty great. Plus it has an on-card autograph. Good stuff. 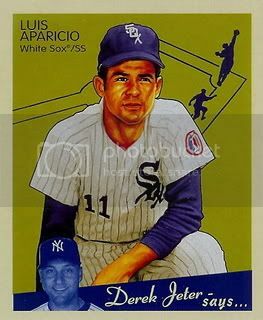 I feel like doing another post for our Luis Aparicio collection today. Back in 2008, Upper Deck came out with their Goudey set. They featured the classic 1934 Goudey design with a nice mix of current and retired players. Lucky for us, Lil Luis was one of the legends included. We have his base card and the mini version in our player collection. I had noticed that a few people having success getting Hall of Famer Wade Boggs autograph TTM around the beginning of July. I didn't have an extra of the Fenway Park card from the Red Sox 2008 Topps team gift set available. I had to overpay for one on Amazon but it was worth it. Last week, we got it back signed by Wade. I was super stoked. 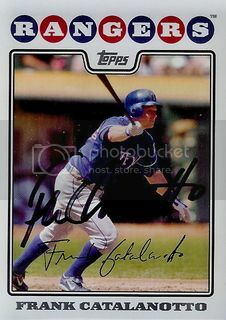 It's a really nice card signed beautifully in blue Sharpie right across third base. Thanks, Mr. Boggs! The first is from July 12, 2008. It features former Tigers starting pitcher, Jeremy Bonderman. In case you were wondering, the Twins beat the Tigers that day 6-5. Curtis Granderson and Joe Mauer both hit home runs. 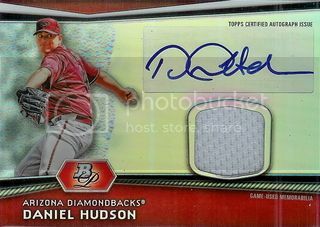 Man, Topps just keeps coming out with Daniel Hudson certified autographed cards. It's good and bad. I really like this card but there's like four other versions of this one from the 2012 Bowman Platinum set out there too. I'm not going after them too hard but if I find a great deal, I won't be saying no. 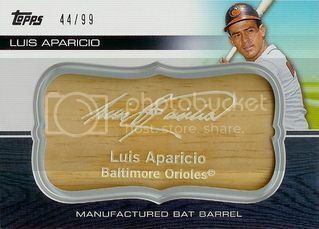 I remember back in 2010 when these manufactured bat cards first came out. I wasn't really picking up any Lil Luis cards except autographs so I didn't pay too much attention to this one. Now that our collection is expanding, I was hoping one of these would reappear. I waited and waited and waited and then finally someone listed one on eBay with a best offer option. I took a risk and sent him an offer of $8 shipped. I'm glad he took it because this card is awesome! I know it's a piece of a fake bat and all but it makes for a really cool, unique baseball card. Way more exciting than the stuff my dad was pulling out of packs during the 60s. 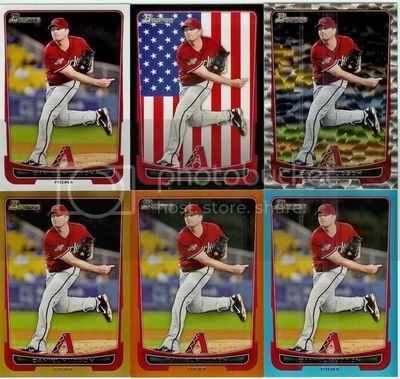 Last week, I realized I probably should have a certified autograph card of 2012 National League All-Star, Wade Miley, in our Diamondbacks Collection. I had searched for Wade Miley a few times but didn't see anything I wanted at a price that seamed reasonable. 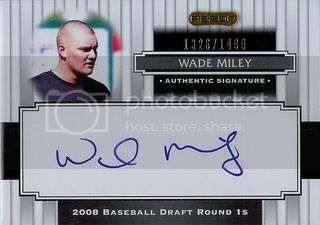 This time I stumbled on a listing for a "WadeMiley" card. That lack of a space in his name meant a good deal for me. While it's not the prettiest card in the world, it is an on-card autograph of the D-Backs most consistent pitcher this year. 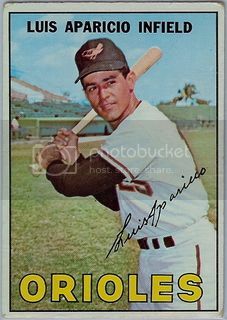 It's been awhile since we've done a post on a vintage Luis Aparicio card. Thanks to Brian from 30-Year Old Cardboard this great 1967 Topps card is now part of our collection. 1967 was the last year Lil Luis played in Baltimore. 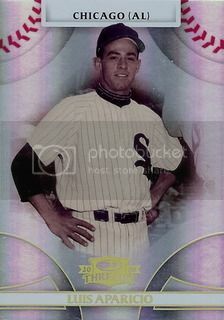 The following year he would return to Chicago for his second stint with the White Sox. Thanks for the cool card, Brian! We've been trying to get the stadium cards from the 2008 Topps 55 card team gift sets signed by some of our favorite Hall of Famers. 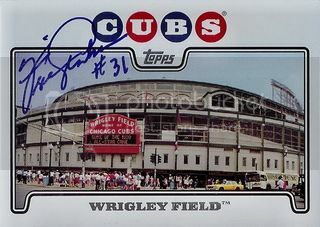 Fergie Jenkins signed this card featuring Wrigley Field for us. Sure Fergie spent time with the Phillies and Rangers but I'll always remember him as a Cubbie. I've had the pleasure of meeting Fergie a few times. He's always been great. Thanks for signing this card for us, Mr. Jenkins. It's one of my favorites.